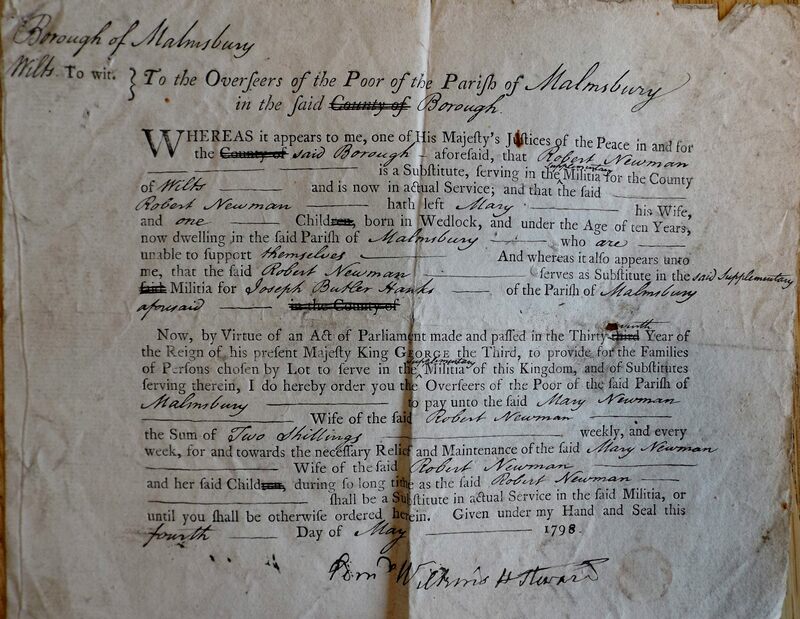 In 1798, Robert NEWMAN, substitute for Joseph Butler HANKS in the supplementary militia “…hath left Mary his Wife and one Child, born in Wedlock, and under the Age of ten years…unable to support themselves”. The Overseers were ordered to pay Two Shillings weekly. After a month serving as substitute for Thomas YEO in 1803, Joseph SMITH had “not been disapproved of and discharged by the Commanding Officer”. Presumably Thomas could not provide a substitute himself and as he was “not possessed of lands…” of a sufficient value (£500), it was ordered that the sum of five pounds, being “Half the current Price paid for a Volunteer” be found from either the parish Volunteer rate (if there was one) or the Poor rate. 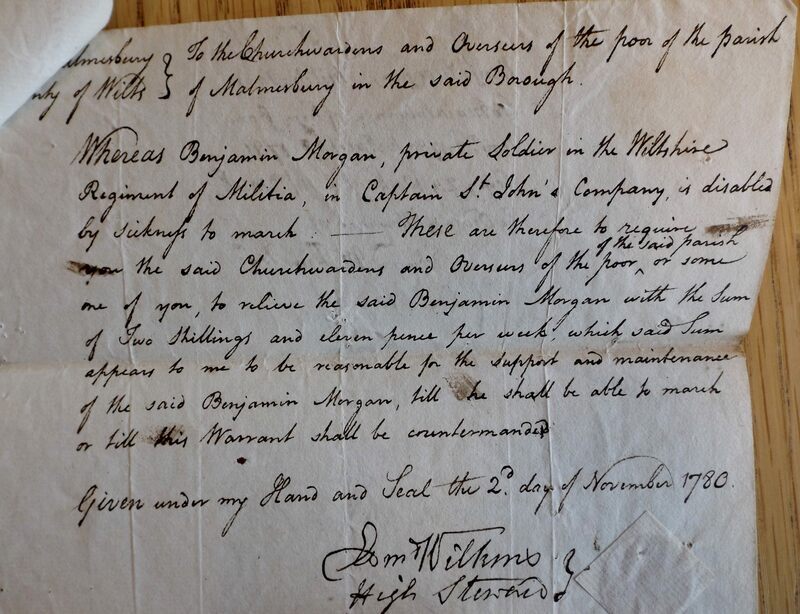 WSHC also has, as part of its holding for the Savernake Estate, records of the Wiltshire Militia including “Muster rolls and Returns of Strength” from 1758 onwards stored under reference 9/34. The National Archives at Kew (TNA) have a good Research Guide to Militia. 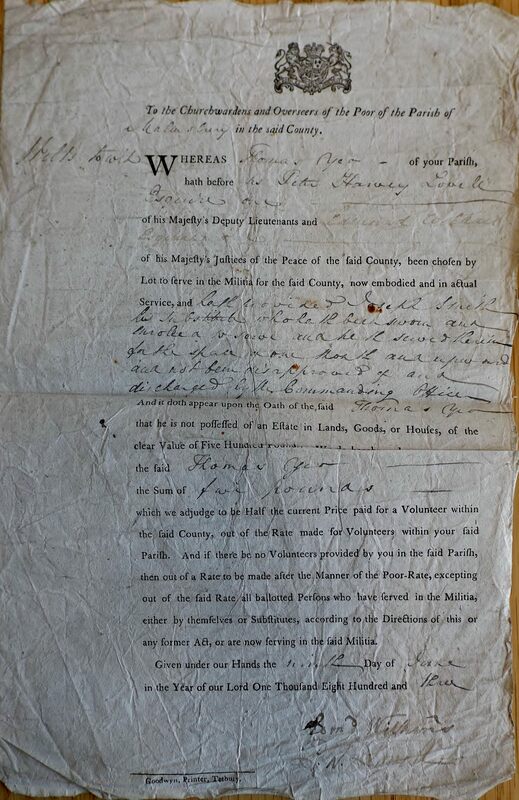 Records of Militia Regiments for 1759 to 1925 are held at TNA under reference WO68. Militia and Volunteers’ Muster Books and Pay Lists for 1778 to 1878 are held at TNA under reference WO13. Ask Woods for the Trees to research your ancestors in the Militia. Read our other family history blog posts here.